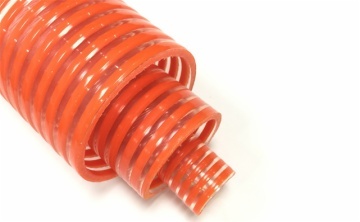 Heavy Duty PVC Helix Spiral Suction and Delivery Hose for Oil and Pump which is also called helix suction hose, spiral reinforced suction hose, water pump suction hose, oil suction and delivery hose, debris suction hose, trash pump hose and vacuum hose etc. Which is heavy duty PVC suction hose designed for high pressure suction or transfer in general industry applications. Widely used for heavy duty suction and delivery of water, sewage, oil, greases, debris, gravels in construction buildings, mining industries, water pump industries, and other general industry applications. This kind of suction hose can be used for collection of waste on environmental waste trucks, pumping the contents of grease pits, sewage collection, lubricants and most light chemicals. Constructed with flexible and tough PVC, reinforced with helical PVC rib, both interior and exterior are smooth, prevent materials blacked and easy for dragging. General purpose hose, good flexibility, light weight, weather and abrasion resistant, UV resistant, smooth tube prevents materials blockage, smooth outer provides easy dragging, , clear wall provides easy inspection of materials flow, rigid helical reinforcement provides high pressure resistant, different lengths available and easily assembled with different couplings and clamps, ideal replace for bulkier and heavier ply-wrapped rubber hose. Working pressure will be decreased under high temperature. Don't use this hose in applications where static may develop unless grounded. This hose can be made with food grade materials for food and beverage.